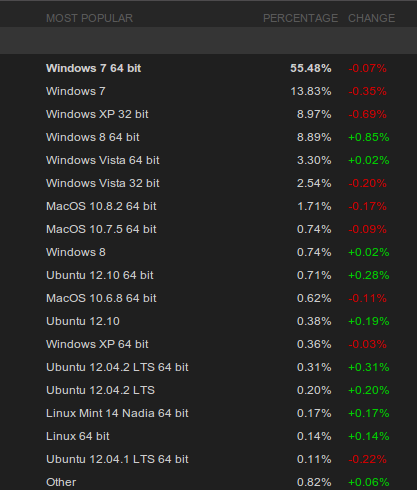 Steam for Linux Adoption Spiking, Closes in on Mac in Just a Few Months of Existence! Exactly a month ago, we published Steam's hardware and software survey results for January with a lot of excitement. Many considered it as a one off event and predicted that Ubuntu and Linux won't be able to sustain that kind of momentum. Well, February's survey results are out and the percentage share of Linux on Steam has almost doubled again! From 1.12% to 2.02% to be precise, without factoring in the "others" category.